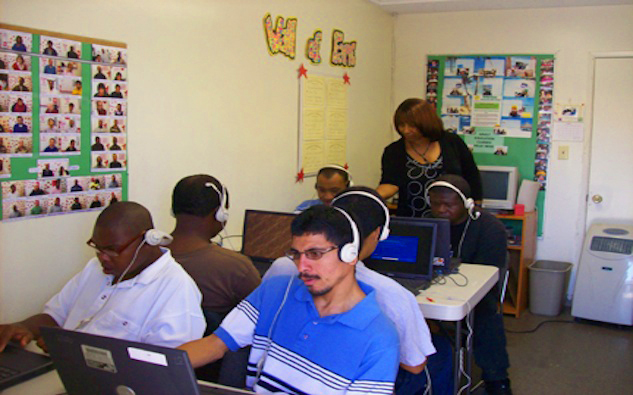 The Adult Development Centers are designed to provide program services to adults with severe/profound developmental disabilities who are not ready for work activity centers, sheltered workshops or other ongoing day programs. In order for the program to provide training at an optimum level, it is our goal to maintain a consumer/staff ratio of four to one. After submitting the admissions application, the consumer will participate in a pre-enrollment skill assessment to determine a basic level of functioning. If the program is deemed suitable, the consumer will be admitted for a 30-day evaluation and adjustment period. During this time, the consumer’s specific training needs will be identified and program goals established. At the end of the 30 day assessment period, a mutually beneficial final enrollment decision will be made. Consumers will be required to bring their lunch to the center daily. Transportation to and from the center will be arranged through the appropriate Regional Center. Hours and days of operation: 9:00 a.m. – 3:00 p.m. Monday through Friday.